More than 150 children's centres closed in England in 2015 - double the number of the previous year. Sure Start children's centres were established in 1998 by the Labour government to provide support for disadvantaged families. 3,259 remain, but numbers have been dwindling since cuts to children's services early intervention budget. The government says many councils are merging centres, but charities are concerned and want a rethink. The figures were obtained by Labour's Dan Jarvis via a written parliamentary question to junior education minister Caroline Dinenage. He said the closures were "deeply concerning" and called on her to explain the situation to Parliament. Closures have been highly unpopular with parents, with opposition to at least one set of closures being heard in the High Court. 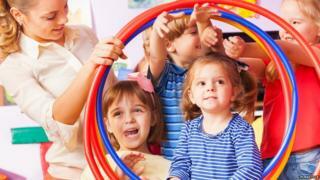 The Pre-school Learning Alliance, which campaigns on early years issues, said the scale of closures appeared to be in conflict with the government's narrative on improving life chances across society. The answer also revealed that the numbers of closures are rising, with 12 closing in 2011, 27 in 2012 and 33 in 2013. In 2014 the number increased to 85, and then 156 last year. "Sure Start centres are a proven success," said Mr Jarvis. "They provide families with childcare in addition to being a one-stop shop for extra support, with things like healthcare or securing job opportunities. "This shows how wrong the Conservatives' priorities are. Because every Sure Start centre that is lost closes a door on a child's chance to get on in life. "A child's earliest years are critical to their future life chances. So early interventions like Sure Start should be the priority, because it is a smart investment for the future and it will give children the best start in life. "With child poverty set to rise by 50% over this parliament, thousands of families will be affected by these closures. We will all pay for this failure in years to come." Chief executive of the Pre-school Learning Alliance Neil Leitch said: "Children's centres are a vital source of advice and practical support for families - especially those more disadvantaged families - and for so many to be disappearing at a time when there is so much government rhetoric on 'closing the gap' and improving children's life chances, seems completely contradictory. "Worse still, a growing number of those children's centres that remain open are unable to offer much more than a skeleton service due to lack of adequate funding, meaning that even more vulnerable families are finding it difficult to access the support they need. "This is clearly not a sustainable situation and so we urge the government to set out its - now long overdue - strategy for securing the future of children's centres as a matter of priority." A Department for Education spokeswoman said it remained committed to giving children the best start in life, and was spending record amounts on childcare. She said: "Many councils are merging centres to allow services to be delivered more efficiently. "Where they decide to close a children's centre site, they must demonstrate that the outcomes for children would not be adversely affected, and will not compromise the duty to have sufficient children's centres to meet local need."